When people think of Amazon, most would immediately think online shopping. What is not so widely known is that they’re also the largest provider of cloud services in the world! It’s with this in mind that I signed up for the Amazon Web Services (AWS) event. 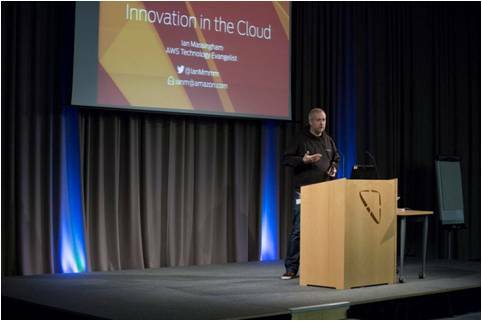 I was keen to know how a company like Amazon moved into Cloud services. They explained that back in 2004, they were looking at how they could deliver their own IT fast and efficiently and realised that other companies were no doubt having the same discussions. This realisation led to Amazon developing cloud services such as SQS (a message queuing service) and S3 (cloud storage). From this small start, AWS have grown into the largest cloud provider in the world. AWS take a truly agile approach to their development. Now agile is something that’s becoming more widespread across DVLA, allowing us to build fast and deliver working prototypes to customers which we can develop and refine in line with user feedback. DVLA is also using cloud infrastructure alongside other cloud services and moving forward the increased use of these services will allow us to concentrate on the aspects that make DVLA different and where we can add real value. Cloud Services always seem to rouse security concerns and that is obviously paramount when we are responsible for personal information but Rob gave some good pointers about how their project worked with Security and Information Assurance stakeholders and what some of the security safeguards they put in place were. James Carnie of Skybrid, a cloud agnostic consultancy firm, showed how the annual cost of provisioning infrastructure on a cloud provider like AWS, can be one tenth of what it would have been to provision the same capability onsite ten years ago. As a government agency we’re constantly challenged with providing more for less, this only strengthens the case for the use of cloud services. Many costs like electricity and maintenance contracts that have to be managed when hosting in your own data centre, disappear when using a cloud provider. James took us through a really powerful case study commissioned by the Welsh Assembly Government, which showed that they could save between 57 - 67% savings on their infrastructure costs by using cloud infrastructure and services. That’s massive and it’s exciting to think we could make similar savings as we move forward. Mark Evans, DVLA’s Chief Architect, set the scene of how the IT landscape is currently changing and the challenges that keeping up with the pace can bring. What’s clear is that the flexibility of Cloud Services will play a huge part in enabling us to keep up with the pace. This will help us to maintain a relentless focus on user needs when developing and improving our services whilst doing more for less.